"My art is more like a researcher's project who uses quotes rather than an essay,with each painting necessitating a bibliography," Jitish Kallat, while defining his art. 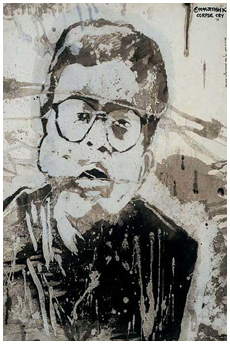 His obsessive use of the self image in his paintings as the main protagonist makes his works autobiographical. The autobiography addresses personal relations as well as the ones he has with his ancestory, time, death .. He chooses a method that is a very economical, nearly abstract , form of narrative. Images float around the protagonist, like icons on a computer screen, creating a webwork. The sources are "any visual material relevant to me." Images of the print media are photocopied, transferred on to the surface, hence 'real', as against the painted which he considers fictional. The images are like a picture puzzle, which the viewer has to decode and conclude upon. The treatment of the picture plane is like a battered wall, and refers to the duality in his painting. 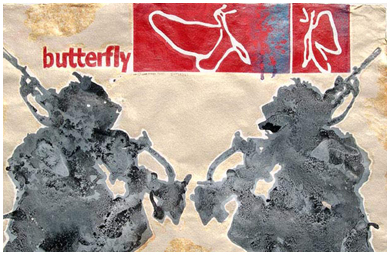 The use of text, for titles, which are very important to Jitish, infuse the paintings with a sense of humour. An emblematic , which actually began as a joke on his classmates while at the Sir J.J. School of Art, is ironical for him. "It is like copyrighting an artwork which itself has been appropriated from so many histories, people, collaborations .." It acknowledges an acceptance as well as his critique of the modernist concept of authorship in which he revels.